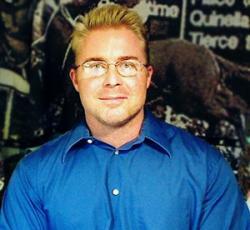 There is an unwritten commandment in thoroughbred horse racing: thou shall not question the trainer — ever. Of course, it is a commandment that I have broken — a lot — because I feel that good handicapping is predicated on understanding the horse, which, in turn, entails understanding the horse’s trainer and, in some cases, even its rider. The fact is trainers have a huge influence on a horse’s past and future performances. There is a reason that Bob Baffert excels in Triple Crown races and other trainers don’t. It is the same reason the New England Patriots are 201-71 (73.9 percent) under Bill Belichick and 210-232 (47.5 percent) under the tutelage of other coaches (and that’s not counting the Boston Patriots years). Now, by nearly all accounts, Art Sherman is a great guy and a fine trainer… but (here comes the hate mail) I’m at a loss trying to figure out what he’s been doing with Dortmund, a once-budding star in Baffert’s barn. As many racing fans will recall, at the start of the year, owner/breeder Kaleem Shah removed 13 horses, including Dortmund, from the care of Baffert and entrusted them to Sherman and Doug O’Neil. Unfortunately, Shah hasn’t been getting much return on that money of late. 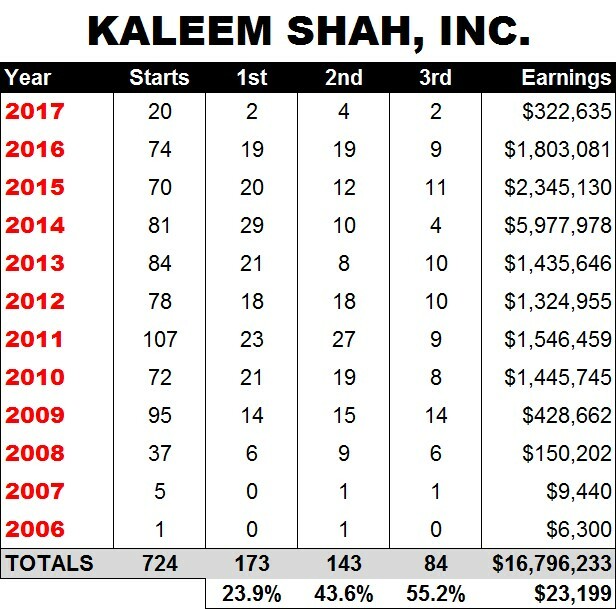 According to Equibase, Shah’s horses have won just twice and earned an average of just over $16k per start from 20 trips to post this year— well below the 23.9 percent win rate and $23,199 earnings per start he has averaged since 2006. To me, Dortmund exemplifies the problem. In two 2017 starts, the son of Big Brown has yet to hit the board. And it’s hard to ignore the somewhat dubious spots Sherman has placed him in. Now, before I expound on this, I must point out that trainers — as many of my trainer friends are quick to remind me when I express views like the above — do not always have total control over when and where their horses run (for all I know, this may have been what caused the rift between Baffert and Shah). But when Dortmund made his 2017 debut in the Frank E. Kilroe Mile, a Grade I affair on the turf, I have to admit I was a little taken aback, despite Sherman’s Wilford Brimley-like insistence that it was the right thing to do. Well, that may be, but, from a statistical standpoint, what Sherman was attempting to do was akin to asking Tim Tebow to knock one out of the park in the bottom of the ninth inning with two outs and a one-run deficit in the World Series. I like Tebow and wish him all the best in his pursuit of a baseball career, but he’s simply not ready for that scenario. Likewise, Dortmund’s recent pace figures practically screamed that he wasn’t prepared to take on some of the best turf milers in the country in the Kilroe. As the Breeders’ Cup has taught us, switching from dirt to turf is hard enough to do in top company, especially for older horses, but tackling stakes-quality foes immediately after posting an inferior late speed ration (my own measurement of late energy disbursement)? Why, it’s next to impossible. Get this: In turf routes featuring a purse of $200k or greater, horses that recorded a below-average LSR (-11 or less) on dirt in their last race won just 5.0 percent of the time and posted — are you ready for this? — a negative 83.42 percent ROI in 139 attempts (this from my database of over 50,000 races). To make matters worse, jockey Victor Espinoza chose to rate Dortmund in the Kilroe, negating the one advantage that Shah’s horse had. Not surprisingly, Dortmund finished dead last. That was followed up, three weeks later, with a try in the ungraded Santana Mile, back on the dirt. This time, there was no attempt to rate, as Dortmund battled with Magic Mark for early supremacy. That duo was heads apart after recording an ESR of -12 (about 13 lengths faster, relatively speaking, than Dortmund went in the Kilroe). Again, not surprisingly, Dortmund faded to finish a well-beaten fourth. Of course, it’s entirely possible that Dortmund is simply not the same horse he was in years past — after all, he hasn’t won since Nov. 28, 2015 — but I can’t help but think that the strategy thus far (whether conceived by Sherman or Shah or a pack of Tarot cards) has not been stellar and I hope that, like Slim Shady, we’ll see the “real” Dortmund before the end of the year.